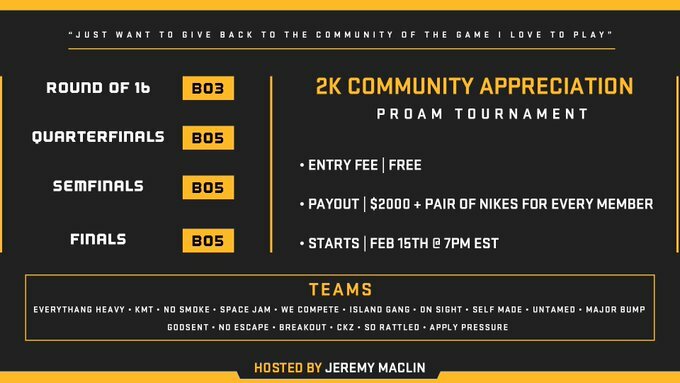 NFL wide receiver Jeremy Maclin is hosting a tournament for the NBA 2K19 Pro-Am community, he revealed Wednesday on his Twitter. “I want this first tournament to be competitive,” Maclin told DIMER. He’s no stranger to 2K competition either—when we spoke, he had just finished playing a WR Pro-Am League game. The 16-team tournament has some of the biggest Pro-Am teams on Xbox, such as established teams Space Jam, Island Gang and Major Bump. Numerous NBA 2K League players, including first-overall pick Dimez and season-one MVP candidate LetsGetItRamo, will feature in the tournament for their respective Pro-Am teams. Maclin has posted a prize pool of $2,000 for the winning teams, plus a pair of Nike shoes for every team member. Maclin began playing NBA 2K in 2K15, primarily playing Park until the end of 2K16. He started a Pro-Am team with his friends, but slowly became exposed to competitive Pro-Am as his team matched up with squads like Island Gang. “We got our tails beat,” Maclin recalls with a laugh. He became more invested in the competitive tournament and has since made some tournament finals. Now, he casually name drops NBA 2K League players and Pro-Am teams, praising guys like Dropoff and casually running through the No Smoke starting lineup. The competitive fire burns even brighter now that the wide receiver matches up against the top players on the game. “I always want to play against the best in everything I do,” Maclin said. He agrees with Adam Silver, who at the NBA 2K League draft in April 2018 declared the league players as athletes. “At the end of the day they are the best at what they do. It takes a lot of mental toughness to be successful. My hat goes off to those guys,” praised Maclin. Maclin’s primary focus is Pro-Am, but he followed the NBA 2K League casually during the season. He says he’d be eager to participate in the NBA 2K League Showcase, a celebrity game conducted last year by the league that drew former NBA players Robert Horry and Brian Scalabrine. The longtime Philadelphia Eagle was selected 19th overall in the 2009 NFL draft, and spent six years with the franchise. He also played for the Kansas City Chiefs and Baltimore Ravens, most recently in 2017. Now a free agent, Maclin spends the majority of his free time playing 2K. It’s out of his appreciation for the community that he wants to give back. He says he’ll host another tournament after the NBA 2K League draft, when most of the top players will have moved on to the league. “I just want to show the 2K community that I appreciate them,” Maclin said. With this tournament, he’s certainly doing that.